Top Cat by blueprint gaming is inspired by the Hanna-Barbera cartoon. Set in between skyscrapers in a modern metropolis, this slot game introduces 9 reels that represent characters from the animated series. Sample the extra features and a variety of bonus games. Playing the mini games gets you cash rewards or free spins. Read our full review below. Get ready to revisit your childhood with Top Cat, a fun slot from Blueprint Gaming that is based on the popular cartoon. If you loved watching the Manhattan alley cats attempt to outsmart Officer Dibble on a daily basis, you will definitely love this slot - and it is filled with lots of bonus features to keep you spinning the reels. Top Cat is a jackpot slot with 5 reels and 20 paylines. In total, there are 10 bonus games, which is definitely more generous than the average slots game. Four of these bonus games can be triggered randomly during the main base game, while five can only be triggered during The Master Plan Bonus. These bonus prizes include multipliers, free spins, respins and cash pickers, but that isn’t all - there is also a progressive jackpot that can pay out a life-changing amount of money. So if you like games with a cartoon theme, or games with a progressive jackpot (and let’s be honest, who doesn’t like a progressive jackpot? ), you’re in the right place. And who knows, you could be the next player to win millions! There are lots of popular slot themes, from horror to film to action. But one theme that has always proven to be popular is cartoon - and it isn’t hard to see why. Cartoon themed slots allow players to revisit their childhood, and you also have the opportunity to win a big cash prize as you reminisce. Top Cat is inspired by the popular Hanna-Barbera cartoon from the 1960s and 70s, and visually, it is a great tribute. The gaming developers have recreated the cartoon style very well, and the layout is perfect - the reels are set in an alleyway between towering skyscrapers in a modern town. Throw in a wooden fence, a lamppost and some trash cans and the scene is perfect! So if you’re ready to travel to the Top Cat universe, so that you can adventure with a gang of stray cats, this slot is perfect for you. Top Cats is one of the most popular cartoon slots on the internet, so you probably won’t be too surprised to hear that the graphics are fantastic. The game is very well crafted, featuring detailed graphics and stunning animations, so it looks amazing. While the theme of the game is fairly simple and childish, that doesn’t mean that it can’t look great –and the eye-catching, fun graphics are perfectly suited to the theme. Top Cat is a fairly traditional slots game, so the main goal for players is to line up matching combinations of symbols to create a win. The game has five different spinning reels with three symbols each, and there are 20 fixed paylines. All of the command buttons can be found right below the reels, so it is very easy for you to modify the game. For instance, if you want to alter your bet, you can click Total Bet. While some people bet low because they have a budget to stick to, it is worth noting that high rollers are more likely to walk away with a big win. This is because the more you bet, the more you are likely to win - so if you’ve got cash to spend, this could be the game for you. However, if you have a budget, don’t feel like you need to bet more. Top Cat is a very popular slot due to its frequent payouts, so even if you place a small bet, you could still win a lot of money! When you have set your bet and you are ready to start playing, simply click Spin to get started. This allows you to spin the reels yourself, but if you are too busy to do this, don’t worry - the game has an Autospin feature that can spin the reels for a number of times while you do something else. All you need to do to trigger this feature is click the Autoplay button, and then the reels will start to spin automatically. Gameplay in Top Cat is quite traditional and classic, so if you regularly play slots games, it is likely that you will quickly understand how the game works. However, don’t be put off by the traditional layout, as the uniqueness of the game is found in all of the bonus games and extra features. So this is still a fairly original slot, although it may not appear so initially. On the reels, you will see nine symbols, most of which you will recognise from the original cartoon. Characters include Fancy Fancy, Brain, Spook and other famous cats from the game. The cats are the highest value symbols, and sometimes they will appear in large groups and take over an entire wheel. This gives you the chance to walk away with a massive win, so keep your eye out for the kitties. Lower paying symbols in the game are represented by classic playing cards, including the Jack, Queen, King and Ace. They offer relatively low payouts, but they appear frequently, so there are lots of chances to win with these symbols. The main thing that you will want to focus on in Top Cat is the special features and the bonus games. There are lots of different bonus features for you to enjoy, so let’s break it down for you. The wild symbol in Top Cat is represented by the fish bones symbol, and this symbol can be used to replace any of the other symbols on the reels. It also features Top Cat, and it can be used to trigger the Master Plan Bonus feature if it lands on the first, third and fifth reel. The game also has a giant hot dog wild that can trigger the respin bonus if it lands on the fifth reel. When this happens, a hot dog vendor will appear on the reels, covering the fifth reel with his hot dog cart. The gang of cats will then appear with a fishing rod, and the reels will start to re-spin. If you win, a payout will be made, and once this is done, the fishing line will pull the stack of wilds one move to the left. This will continue until the wilds are completely dragged off the reels. This fun feature allows players to choose from random bins to see if they can find a multiplier prize. If you manage to find Officer Dibble, you will win a multiplier. This feature is a 2 stage trail bonus. During stage one, you will move along the trail to see if you can find multipliers, and when you move to stage two, you will head to a big money board where you can win cash prizes. This awesome bonus feature can significantly increase your winnings. This feature allows you to collect Top Cat Stickers, which will appear on top of the reels. The more stickers you pick up, the higher your chances are of advancing to the next set of reels, where you can win more free spins and extra wilds. This feature offers unlimited free spins, and it is played on a second set of reels that are set in a diner. If you manage to trigger this feature, you should look out for the scatter symbol on the fifth reel - if this happens, the meal tickets on the right side of the reels will fall off screen, and the chef will change the meal. You can win multipliers and free spins during this game - but once all of the tickets have fallen down, the bonus feature will end. This feature will add special wilds to the reels, although they will act like normal wilds during the first spin. Once you have done the first spin, the wilds will start to float around the reels, and if two hit each other, the whole reel will turn wild. The Master Plan Bonus features aren’t the only features for you to enjoy as you play. There are also four Call Or Nothing bonuses that can be triggered during the base game. This feature sees Choo the cat on the reels. He will walk into the centre of the reels, and then a piano will drop onto his head - but don’t worry, as this will start to turn random symbols on the reels into wilds. This feature begin with Brain arriving on the reels with a spanner, which he then uses to release a fire hydrant from under each reel. The water from the hydrants can turn the reels wild, and the round will only end when Brain has unlocked all five sets of reels. This feature will begin when Benny the cat appears on the reels. He will then press a button that makes a large TV appear, which then adds lots of TV symbols to the reels. This feature starts with mice appearing next to the symbols on the reels, making it easier for you to create a winning combination. If Top Cat blows his whistle during this time, the mice will move around the reels to help create a second win. This will continue until Officer Dibble appears to end the game. There is also a Jackpot feature in Top Cat that can be triggered if you manage to land five Jackpot King overlay symbols on the reels. When this happens, you will get the chance to spin a second set of reels, and your main goal is to collect crown symbols to build up a big multiplier. You can also choose one of the treasures on the screen to trigger a reel spin or a jackpot prize. This is definitely one of the most exciting bonus features in the game. More and more websites are starting to offer games that offer no deposit bonuses. This means that you can grab bonuses as soon as you sign up to the casino, and you don’t even need to make a deposit to win. This is very popular - but it isn’t an option if you are playing Top Cat, and it isn’t too hard to see why. After all, the game is very generous, offering lots of bonus games as well as a jackpot feature, so you will need to make a deposit if you want to play for money. However, the game is well worth the cost! If you prefer playing games on your mobile or tablet, you’re not alone. In fact, last year was the first time that mobile users overtook laptop and desktop users. Thankfully, it is entirely possible to play Top Cat on tablet and mobile devices. This is because the game has been optimised for all devices, so it will load perfectly on every platform. Even the high quality graphics will look just as good! However, it is worth noting that the game may run more slowly on your mobile, especially if you don’t have much RAM on the device. It is also worth mentioning that your internet connection may be affected, especially if you are playing using 3G. For this reason, it is worth waiting until you have a reliable WiFi connection before you start playing. After all, no-one wants the game to cut out during a winning streak! 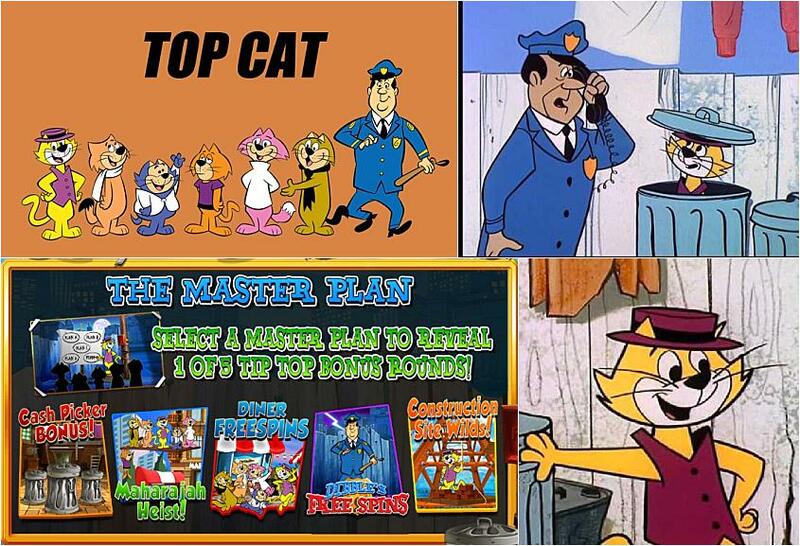 With all that being said, you can still play Top Cat on your desktop or your laptop if you want. More and more players are making the switch to mobile devices, but in reality, there are lots of benefits to playing from a laptop - you have a much larger screen, and the sound system tends to be better. This makes it easier for you to enjoy Top Cat to the fullest extent. Before you spin the reels in Top Cat for money, you may want to consider starting off by playing for free. This will give you the chance to learn more about the game and how it works before you spend any money, which can be a very smart decision. After all, there are lots of different bonus features to enjoy in Top Cat, and if you fully understand how they work before spending anything, you are more likely to understand how to win. It can be useful to spin the reels at least 100 times before placing a real money bet. This gives you the chance to find out if the game appeals to you, and it will also teach you more about the odds of winning. If you decide to do this, it can also be useful to use the same bet amount, as this will help you to find out if your budget is suited to the game. The RTP (return to player) in Top Cat is 92.48%. This isn’t very high, but it doesn’t mean that you won’t win. After all, this game has some of the most impressive bonus games that we have ever seen! There are also lots of free spins up for grabs, so if you are lucky, you will have a very lucrative game. What does RTP actually mean? RTP means the amount of money that is returned to the players who play the game for a long period of time. This basically means that if you deposit £100 on this game, it is likely that you will get 92.48% of your money back. However, lots of players have won tens of thousands of pounds as they spin the reels, and they certainly didn’t all deposit thousands of pounds! It is very easy to start spinning the reels with Top Cat. You can play here at Slots Temple for free, with no signup required. If you want to play for real money, all you need to do is set up an account with one of our recommended casinos. The sign up process is very simple and quick, and once you have signed up, you will be able to add a valid payment method to your account, such as PayPal or bank transfer. Once you have done this, you can play Top Cat for real money. The first thing that you will need to do is press the Total Bet button to set the amount of your bet. You can bet anything between 20p and £500, so there is a lot of variation with this game. You can play whether you are a high roller or someone on a budget. All 20 paylines in this game are fixed for the spins, so you will only need to determine your coin value and bet level. Once you are done, you can click the up arrow to save your changes, and then you will return to the main screen. Once you have set your bet, you can start the game by clicking Spin. The reels will then start to turn before stopping at random. If the symbols on the reels include a matching combination of at least two or three symbols, you will win a prize, and the winnings will be credited to your account. If you manage to get three bonus scatter symbols on the reels, then you will trigger the Master Plan bonus. If you love Blueprint Gaming and you want to check out other popular games from them, there are a few slots that stand out. These titles are all very popular, and they all come with lots of bonus games and multipliers. If you are looking for a game that is just as entertaining as Top Cat, consider spinning the reels with Plants vs. Zombies. This slot has a lot of entertaining in-game action, and while the graphics may initially seem simple, the slot is very modern and up to date. The game also has a progressive jackpot like Top Cat, so if this is why you love Top Cat, you should definitely check out Plants vs. Zombies. You could also spin the reels with Worms, a fun game that is based on the computer game from your childhood. This is perfect for people who like Top Cat, because it gives them the chance to reminisce about their childhood - and there are also lots of fun bonus games for you to enjoy. Harry Trotter Pig Wizard is also a good option for anyone who is looking for a funny slot with lots of ways to win. The game is a Harry Potter parody, and there is even a bonus round that will remind players of Deal or No Deal. Gaming is a serious subject, especially if you are putting money on the game, so it is very important to properly review any game before you play it. So here is what we really think about Top Cat. When it comes to the Top Cat slot, there are lots of things for players to enjoy…starting with the nostalgia that you will feel as soon as you load up the game. This is because the graphics and the soundtrack are very similar to the original TV show, so you will almost feel like you have travelled back in time to your childhood. But that isn’t all. Top Cat also has lots of wonderful bonus features that will tempt lots of people to try out the game. After all, most slots only have one or two bonus features, but Top Cat has 10 bonus features in total - very generous! The bonus features also offer very handsome rewards, especially if you manage to access the progressive jackpot. So there is definitely a chance that you will walk away with a giant win, which will appeal to a lot of players. Top Cat may seem like a classic slots game when you first load it up, but as you spin the reels, you will be pleasantly surprised by the direction that the game takes. You could end up playing multiple bonus games as you spin the reels, or you could end up taking your chances with the progressive jackpot - it is hard to know for sure what will happen, but there are definitely lots of excellent options. On top of the bonus games, there are also some giant payouts available. The progressive jackpot feature can pay out thousands of pounds per win, and the other bonus games allow you to significantly increase your winnings. It is very rare that a game with a fairly low RTP has such excellent payouts. It is very difficult to think of anything bad to say about the Top Cat slot. Even though the game has been around for a few years, it is still very popular, showing that it has passed the test of time. The graphics are also still modern and up to date, so you don’t need to worry about playing a game that feels dated or old. In fact, there are lots of new slots with graphics that aren’t as appealing as Top Cat. If we could only change one thing about the game (and it would be very hard to think of one thing, as this really is a very impressive game), we would probably add more free spins to the game. Lots of players love free spins, and while the game does currently offer free spins, it is definitely more focused on multiplier prizes. However, this isn’t really much of a complaint, as the game does still have free spins. Either way, this is the kind of slot that will appeal to lots of players, as it is an excellent slot that the majority of slots players will enjoy. After all, who doesn’t love a nostalgic game that can pay out thousands? If you are interested in slots, it is very likely that you have already heard of Blueprint Gaming. The company has been around for many years, and it creates slots for both online casinos and land-based casinos. In 2008, the company was acquired by famous German gambling company, the Gauselmann group, which helped them to become more popular online. Blueprint creates lots of unique games of its own, and it is well known for producing games that are licensed by big TV shows and films. Top Cat is an excellent example of this, but other popular slots include Worms and Casper the Ghost. So if you like games that make you feel nostalgic, it is very likely that you will enjoy Blueprint’s licensed TV and movie slots. Another noteworthy thing about Blueprint Gaming is the randomness of its game styles. While many companies use similar styles in most of their games, Blueprint has released lots of games with lots of different layouts and styles. For example, there are Blueprint slots that come with lots of bonus features and jackpots, but there are also super simple games that don’t have any extra features. The only thing that all of the games have in common is smooth gameplay and a professional layout, both of which are very important factors to most players. One of the main reasons why Blueprint is so popular is because some of its slots are very unique. For instance, the Winstar slot may seem like a fairly basic game without too many bonus features, but it does have a special symbol that can transform into regular symbols when it lands. The symbols will then become stacked, and they can even appear on multiple lines. This cool feature can’t be found in many games, and it provides players with a fun new way to increase their winnings. So if you are tired of playing games that feel the same and you are looking for an original slot game, Blueprint Gaming could have the perfect game for you. Most Blueprint Gaming slots can be played on mobile and tablet devices. They can also be found in many real life casinos throughout the UK, if you prefer a live experience. The company also produces a wide range of other casino games, and it has even created a few non-gambling slots. One great example of this is the Peggle slot, which has original gameplay and lots of fun features. Another non-gambling game is Chuzzle, which has a background game with stacked creatures. So if you are a little bored of spinning the reels and you want to try something slightly different, there are lots of other Blueprint games for you to choose from. Slots Temple takes responsible gaming very seriously, so there are lots of measures in place to make sure that players are safe when they play any of our games. If you are worried about your gambling habit, you can contact customer service at any online casino to ask if they can put a temporary block on your account. This means that you won’t be able to access your account for a set amount of time. But don’t worry, once the time limit is up you will be able to use your account again. Many people find that regular breaks help to stop them from becoming addicted to gambling. If you are worried about sticking to a budget, you can again contact customer services at any casino and ask them to put a spending limit on your account. This is very useful for people who overspend, as it means that once they reach the limit, they can’t spend any more. This can help to keep your gambling in check, which is very important if you have a strict budget. Players can also shut down their account completely, whenever they want. This should be done if you know that you have a gambling problem, especially if your gambling problem is affecting your life and your finances. Top Cat is a completely fair, unbiased game, so you don’t need to worry about playing a game that is stacked against you. This is because all of the games at Slots Temple are tested by independent regulators to ensure that they are fair, and Blueprint also test its games before it releases them. So whether you want to play Top Cat or a different game, either way you can be safe in the knowledge that the game is completely fair. Can I play Top Cat for free? Yes, you can play Top Cat for free if you want. This is a great way to find out if you want to actually play the game for money or not, as it will teach you more about the layout and the bonus rounds. Does Top Cat have free spins? Yes, it is possible to win free spins when you are playing Top Cat. You can also trigger respins during some of the game’s bonus features. Can I win real money while Playing Top Cat? Yes, you can definitely win real money when you are spinning the reels with Top Cat, if you sign up to one of our recommended casinos. If you play for free at Slots Temple, though, you cannot win real money. When playing at an online casino, there are lots of bonus features and symbols that can pay out big wins. In fact, in the past, players have won thousands of pounds during a single Top Cat game. Do you have any Top Cat tips or cheats? Sadly, it is impossible to guarantee a win when you are playing Top Cat. This is because all games created by Blueprint Gaming use a Random Number Generator to make sure that every single spin is completely random. This benefits both the players and the casino, as it means that every game is fair and unbiased. So this means you can trust that the game is fair - but it also means that you won’t be able to guarantee a win. If you are playing Top Cat and you want to ensure that you don’t overspend when you are playing, you could set a budget beforehand to help. This means that you don’t need to worry about getting carried away while you are playing, as the game will stop once you reach your budget. You could also set a time limit on your account to make sure that you don’t play for too long. If you are interested in either of these options, simply contact customer support at your chosen online casino and they will be able to help you set limits on your account. Can I play Top Cat with no deposit? You can spin the reels for free here at Slots Temple without putting down a deposit, but if you want to win money when you are playing Top Cat, then you will need to sign up to an online casino and make a deposit using a valid banking method (such as Neteller or PayPal). Once you have made a deposit, you will be able to play Top Cat. Can I download Top Cat? You don’t need to download Top Cat if you want to play it. This is because all Blueprint games are available to play directly from your browser, whether you are using a computer, a laptop, a mobile or a tablet. * Top Cat trademark / license is owned by Blueprint Gaming. This site is not endorsed by Blueprint Gaming.